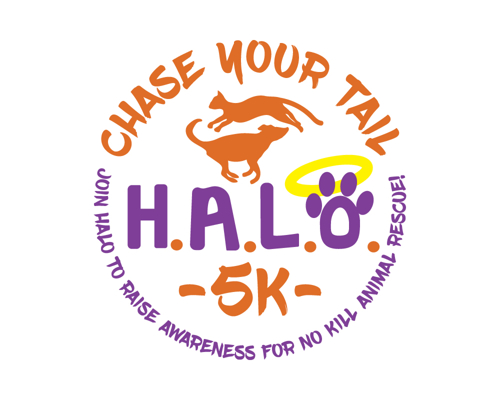 Join HALO Rescue's 2nd Annual 5K Run/Walk to raise awareness for no kill animal rescue! The event is for runners, walkers, and their dogs! Fun for athletes, beginners, kids and dogs all while raising money to save lives! The 5K will start at 7:30am at Sebastian's Community Center and travel along the beautiful Indian River. Same day registration opens at 6:30 am... early bird gets the worm! Every $30 donated will get you 1 entry to the event. Each entry will include a race packet, a pawsome Sport-Tek "Chase Your Tail" t-shirt, a gift bag filled with goodies, and a scrumptious meal after the race! Gold medals will be given out to the Overall Male & Female winners, Age group medals in gold, silver & bronze 3 deep in each of the following age groups: (10 & Under) (10-19) (20-29) (30-39) (40-49) (50-59) (60-69) (70 & over), & Youngest Finisher gets to walk away with the gold! Bonus... a gift basket for 1st place pup! Can't join us, please still DONATE to support our rescue friends! We promise you a great cause and lots of furry fun! Thank you so much for all your love and support! Packet Pickup will be the day before the race at Runner's Depot from 10-5 and at the race starting at 6:30.